The addition of beryllium in copper alloy materials gives a substantial increase in strength without resulting in brittle behavior. Due to these improved properties, beryllium alloys are used widely in the aviation industries in components which require high strength and a high tolerance to wear. Beryllium metal is used in a variety of alloys including the alloy, copper beryllium. 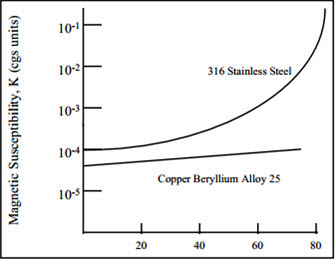 Beryllium-copper alloys are amongst the strongest of the copper alloys. They are commonly used at cryogenic temperatures where, like other copper alloys, they do not become brittle. They can be machined relatively easily, and are readily joined by soft soldering or brazing. Handling and most machining operations concerning beryllium-copper alloys are considered non-hazardous. In the aviation industry copper beryllium has been used in a variety of components due to its strength and tolerance to wear and its’ electricity conductivity (e.g. high load and stress bushes on aircraft under carriage and propeller electrical contact slip rings). The literature contains many additional references on the properties of copper-beryllium alloys. Most of these, however, pertain to the response of copper-beryllium alloys to precipitation heat treatment, to their forming characteristics, and to their use for specific applications with little or no data that can be used for general engineering design. There are two classes of copper beryllium alloys: High Strength Copper Beryllium has the highest strength of any copper alloy, and offers good thermal and electrical conductivity’s. Depending on the product form, the tensile strength can exceed 200,000 psi (140 kg/mm2), with an electrical conductivity in the range of 18-25% IACS, and a thermal conductivity of 60 BTU/ft·hr·°F (105 W/m·K). The high conductivity of copper beryllium alloys offers considerably better conductivity’s (50-60% IACS and 145 BTU/ft·hr·°F, 250 W/m·K) at a moderate strength level of about 120,000 psi (85 kg/mm2). The high conductivity copper beryllium alloys are diamagnetic and have magnetic behavior similar to metallic copper. 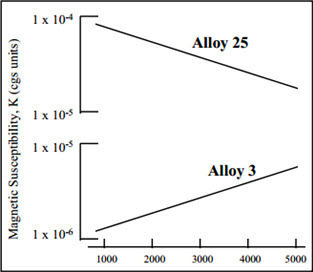 The high strength alloys, typical of most copper alloys, are weakly paramagnetic. 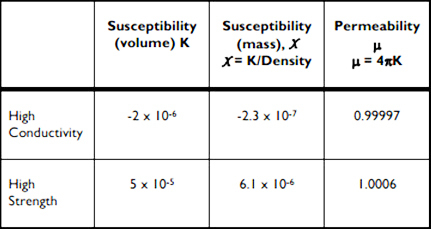 Table 1 lists copper beryllium’s typical magnetic properties as determined by the Gouy balance and vibrating sample magnetometry techniques. Copper beryllium’s magnetic properties are constant over the entire strength range of the alloys. The magnetic properties are not temperature dependent from liquid helium to above room temperature. Figure 2 shows that magnetic field strength has a minor influence on the magnetic properties of copper beryllium. Cold work or plastic deformation does not change the magnetic performance of copper beryllium. As a result of cold work, which may occur in service, some nonmagnetic austenitic stainless steels transform to ferromagnetic martensite. 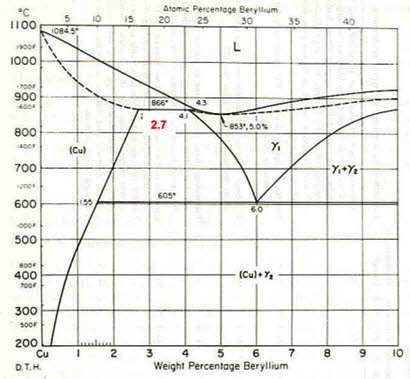 As shown in Figure 3, deformation increases the susceptibility of the stainless steel while it has no effect on copper beryllium. The localized deformation from machining or surface abuse can result in magnetic hot spots in stainless steel. The martensitic transformation in stainless steels occurs more readily at low temperatures. Accumulated strains, resulting from thermal cycling to low temperature, can cause a deterioration in nonmagnetic quality in stainless steel. This is not a problem with copper beryllium.